There were many a chasing-in-a-circle fake battles that night! Rock beats Scissors beats Paper beats Rock...but mom's gonna beat all of you (*jk!) if you don't stop! 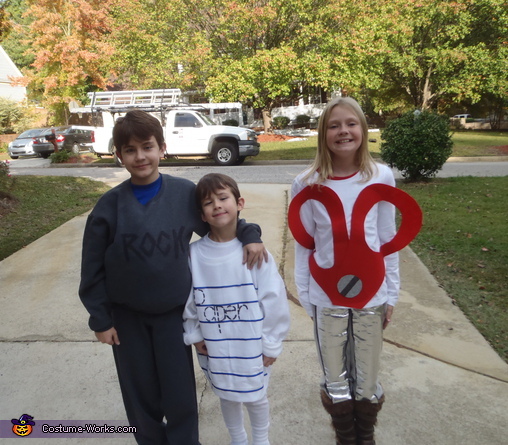 This homemade costume for kids entered our 2011 Halloween Costume Contest, and won 2nd place in the Most Creative Costume nomination! I wish I could take credit, but little Joe came up with idea during a brainstorming session. I made the costumes for a total of about $50. It's just sweatsuits or shirts, marker, chalk, ribbon, felt, silver duct tape, and hot glue. Brilliant! Kudos for picking a group costume that allows for physical hijinks. Yay! When I did it there was only ONE other photo on the Internet--and it was all girls so I had to adapt it. I'd be happy to make you a set! Email me at mirhardy[at]gmail.com. I would also like to know how much a costume like this would cost. Have a 9,yr. Girl, 7 yr. Boy and 4 yr boy!